3D printing electronics isn’t a wave of the future; it’s here right now. 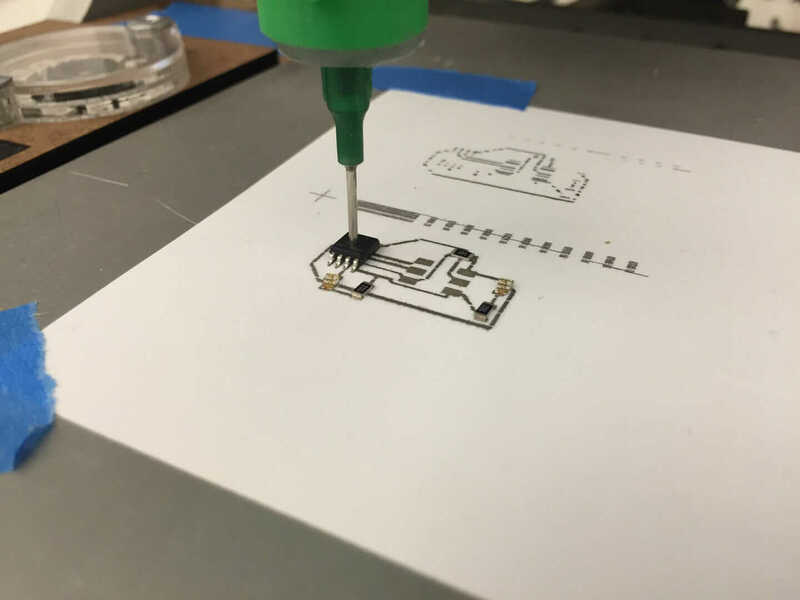 Electronics designers can now print electronic devices in one piece and integrate them in any shape and/or place never before thought possible. “3D-electronics printers could one day make circuit boards a thing of the past,” says Daniel Oliver, cofounder of Voxel8. The Somerville, Mass., company is set to produce its Voxel8 electronics 3D-circuit printers. 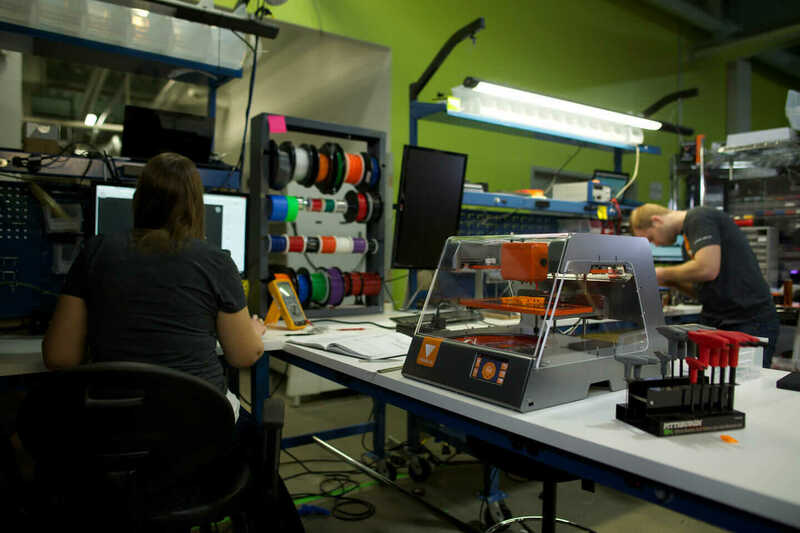 The printer allows engineers and designers to quickly design and prototype novel devices, such as 3D-printed antennas or electromagnetic coils, and to stack integrated circuits in ways that weren’t previously possible. Voxel8 launched in January and is taking orders for its first generation of printers, which Oliver expects will be delivered later this year. He won’t say how many printers the company expects to ship this year, but the number will be small. “At first, we see these being used mainly for prototyping,” he says. Other companies have considered making 3D-printed, flexible circuit boards that can be used in fabric or other nontraditional materials. Take Cartesian Co., which makes a 3D printer capable of speedily turning out small circuit boards. “Our printer could be used to seamlessly weave electronics into fabric, like flexible watchbands and clothing,” says Ariel Briner, CEO at Cartesian Co. His company recently unveiled The Argentum—a desktop printer that makes circuit boards as large as a postcard—on Kickstarter. The company has so far fulfilled about 150 orders for the product. Flexible circuit boards. Courtesy Cartesian Co. Meanwhile, Carlos Ospina’s Queens, N.Y.–based company, BotFactory (also funded on Kickstarter), makes a 3D printer called Squink, which can also print circuit boards in minutes. “These quick-printed circuit boards may offer ways for niche markets to make inexpensive, even flexible circuit boards and to prototype quickly,” says Ospina, who is BotFactory’s CTO. “You wouldn’t have to wait for boards from China or to order expensive boards from here in the U.S. if you wanted to prototype or produce a small batch of something.” BotFactory is set to begin shipping its printers to Kickstarter investors this spring. 3D-electronics printers can produce electronic parts and designs that don’t look like anything coming off of today’s assembly lines. For instance, Hod Lipson, a Cornell University associate professor of mechanical and aerospace engineering, says 3D printing allows for the design of products that don’t follow the previously standard boxlike lines. Lipson, who was involved with the team that created Fab@Home (a platform of printers and programs that produces 3D objects), also says the printers can print in any shape, which isn’t true for today’s manufacturing methods. Oliver of Voxel8 agrees. “This is a way to break the geometry of a standard printed circuit board, to take it and twist it and turn it and fold it on itself and bend it and get away from the 2D world,” he says. Squink picking and placing an ATtiny85 microcontroller onto a circuit board. Courtesy BotFactory. 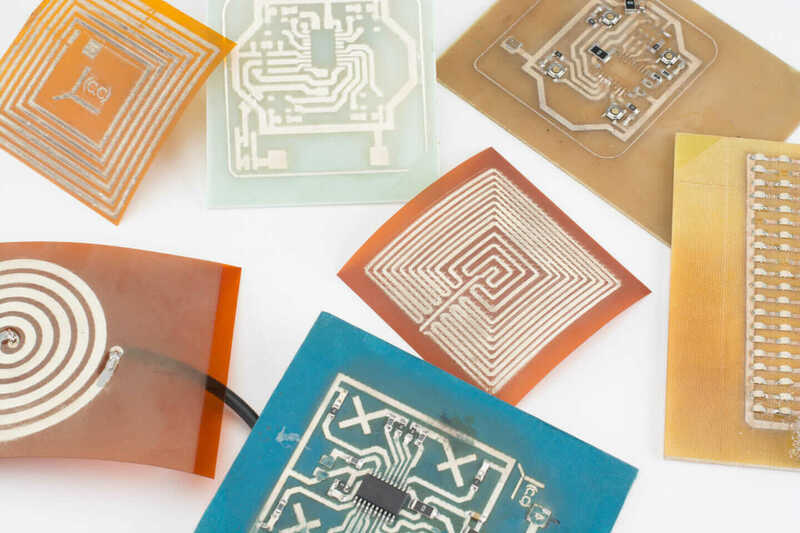 Leaving the 2D world allows engineers to print electronics such as an antenna. The key is in the materials. The Voxel8 can print materials like thermoplastics and highly conductive silver inks at the same time, which allows for customized electronic devices such as electromagnets and 3D-electromechanical assemblies. The low-temperature, conductive ink cures at room temperature rather than in an oven, as is the case for most conductive inks. The ink is used to print the internal wiring between the components while the components themselves are hand placed in the circuit . . . at least for now. The brains behind the conductive ink come from the lab of Jennifer A. Lewis, who is a Harvard University professor of engineering and applied science and whose lab has demonstrated advances in multimaterial 3D printing, including the conductive inks as well as embedded sensors in stretchable matrices. Lewis cofounded Voxel8, and two former Lewis Lab PhD students, Michael Bell and Travis Busbee, are also among the company’s founders. But the printer alone can’t make electronics. Voxel8 has partnered with Autodesk to create Project Wire, the software for designing 3D-printed electronics. The program runs on Autodesk’s Spark platform, an open-source application-programming interface that helps connect the many components of 3D printing. 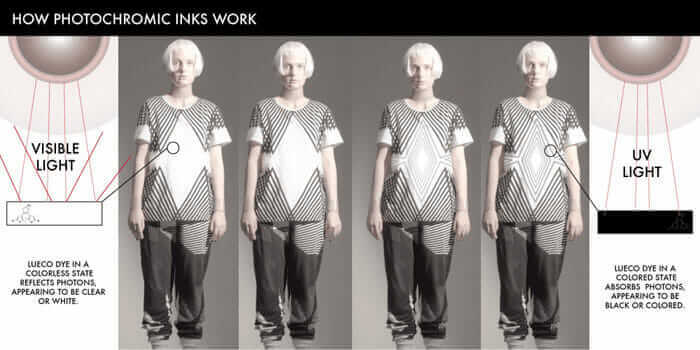 Photochromia apparel collection of UV-responsive digital prints. Courtesy BotFactory. As for Cartesian Co., Briner and his team are hoping to push boundaries with their desktop circuit-board printer. The company uses inkjet cartridges filled with conductive ink. The printers can also print in silver. Briner says the Cartesian printer can print a 2-inch-by-2-inch board in under an hour. For his part, Ospina of BotFactory expects electrical engineers and designers to be printing circuit boards in the future the same way others print objects on their thermoplastic 3D printers today. This would allow small manufacturers to incorporate electrical components within their systems and to create them speedily.